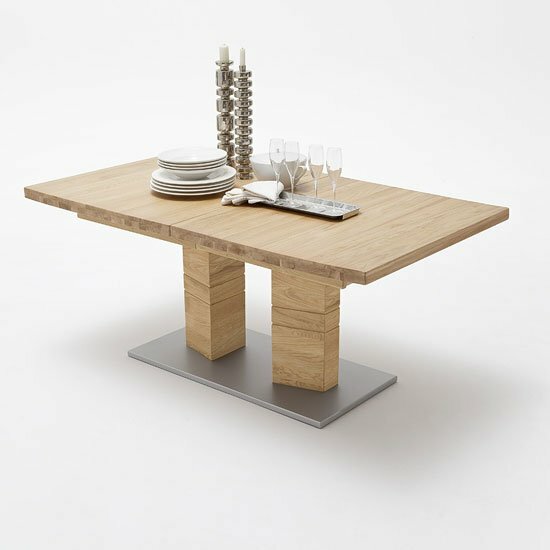 Solid oak dining table and benches can become an integral part of any kitchen or dining room. Even though a bench creates a rustic, simple atmosphere, oak is a very elegant and rich-looking interior design solution. So, you get a chance to create a very impressive contrast of minimalism and exquisiteness. Unlike a set of chairs, a couple of benches feature a very flexible seating capacity, which can become a great plus when you have people over. Even though a bench does not provide the same comfort as a chair while seating, it looks unusual and has what it takes to make an atmosphere in your dining room unique. Oak is one of the most solid, durable materials there are. If you are looking for furniture that will literally last for ages, you should definitely consider items made of solid oak. Wood like this does not get deformed over the years, it can preserve its shape even in the relatively humid environments, and it is simply gorgeous to look on. Unusual design of a solid oak dining table and benches makes the set a perfect fit both for modern and traditional interiors. And, it will look astonishing in the mixed style apartments – provided you take your time to carefully consider the balance between your furniture items. Generally, any wood is relatively easy to integrate into various colour palettes. Oak, in particular, has several shades to choose from – so, even if you already have wooden furniture in your home, you will be able to find an exact oak shade to match your interior. All in all, a solid oak dining table and benches carefully balance modernity and tradition, creating a one-of-a-kind, unforgettable atmosphere in any home. If you feel that this kind of interior arrangement might be something you are looking for in your home, you should probably start your search with big furniture stores rather than with small, strictly local, or simply recently established retail chains. First of all, solid oak is a relatively expensive material, and small stores will unlikely offer you any comprehensive discounts. Next, local stores do not normally have much of a selection, as they work with local manufacturers exclusively. In other words, if you want to broaden your horizons not only to UK, but also to some of the European furniture suppliers, a big retail chain is always more preferable.